This is another part of the recent coverage from Mattel's display of WWE action figures from the Toy Fair event earlier this month. Several new action figures have been revealed by Mattel, but what about some of the new toys coming out from other companies? WWE's popular line of Pop Vinyls by Funko will continue on with some brand new additions. New figures of Jake "The Snake" Roberts and Shawn Michaels were shown off at the event. It was also later revealed that new Pops based off of legendary wrestlers Sting and Lex Luger will be sold together as a 2-pack. The set of Pop figures including Luger and Sting will be an exclusive set sold at FYE stores. In addition to some of the action figures that were displayed by Mattel, the toy company also decided to reveal some brand new dolls that will be coming out soon. Mattel and WWE announced the new line of Barbie-like dolls at the San Diego Comic Con last year and they have been selling quite well thus far, as evidenced by the several new dolls that will be coming out soon. Brand new dolls based off of Charlotte Flair, Alexa Bliss, Natalya, Asuka, and Carmella are all on the way. It also appears that a new line of plush dolls based off of the female stars of WWE will be coming out very soon as well, starting off with dolls of Becky Lynch, Bayley, and Sasha Banks. Finally, fans of the recently relaunched Entrance Greats line will be pleased to know that the next figure in the set has been revealed. Following up the highly-anticipated releases of Kurt Angle and Jeff Hardy, it turns out that current Smackdown star Bobby Roode will be getting the next Entrance Greats figure treatment. 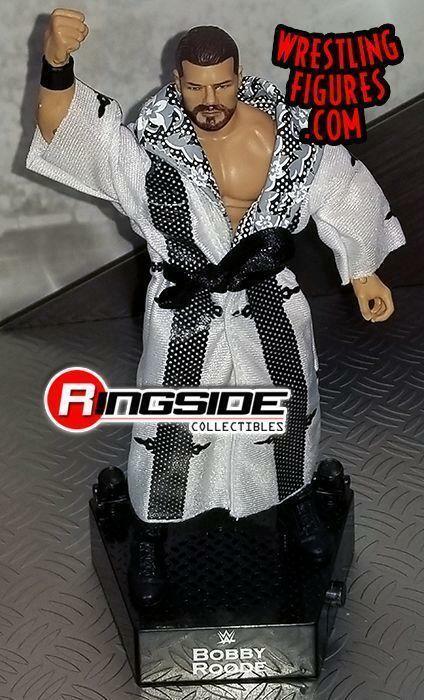 Roode is made in Elite-style and has a removable white robe. As always, this figure will include a display stand capable of playing a brief snippet of Roode's entrance theme. Your collection can be a lot more "Glorious" with the addition of this new Bobby Roode action figure. This Entrance Greats figure will be released by the end of the spring. Be sure to stay tuned for more updates from Toy Fair!